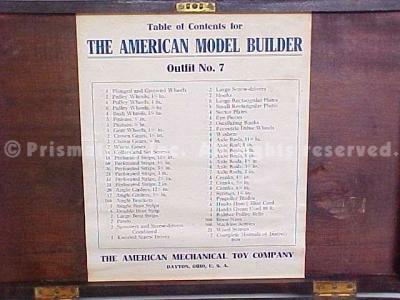 Listed below are some of the other notable construction toy systems that were produced during the 20th century. The list is by no means exhaustive, as by some estimates hundreds of such systems have come and gone over the years. Hi folks, Doc here. 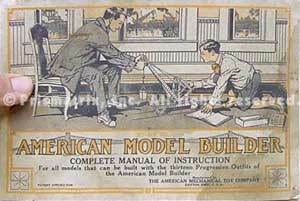 In the early years of the 20th century, there were very few players in the relatively new metal construction toy hobby, all of them in Europe. 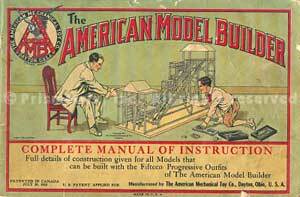 Then, in the the United States, two new systems appeared almost simultaneously: Erector and American Model Builder (AMB). While A.C. Gilbert was developing his Erector system in New Haven, Connecticut, Francis Wagner was working on his own system in Dayton, Ohio. 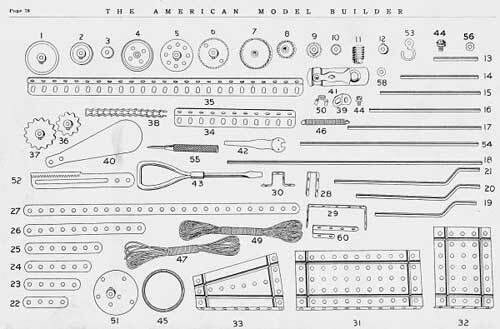 Both Wagner and Gilbert were influenced by the Meccano system that had been developed by Frank Hornby in England in 1901. With his new Erector sets, Gilbert had sought to design something different. 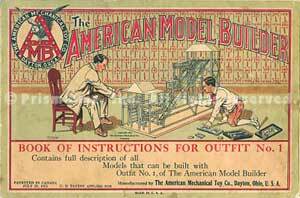 But Wagner, who had left his job at National Cash Register to start the American Mechanical Toy Company in 1911, took a different tack: he opted to copy the Meccano system, replicating many of the basic parts almost perfectly. His exact reasons for doing so are unclear, but this decision would prove fateful when Meccano sued him for copyright infringement. 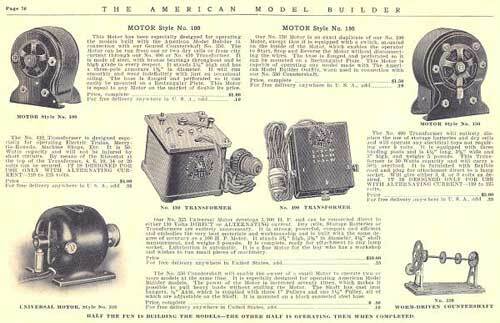 Although the legal battles lasted for a number of years, the suit was eventually settled in Meccano's favor and by 1921, just 9 years after first appearing on the market, AMB had ceased production. 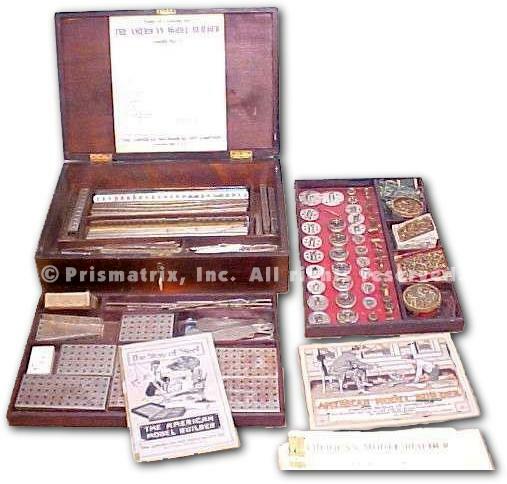 By the end of AMB's short run, the product line included fifteen sets in all, eight standard sets numbered 0-7 and seven supplemental sets numbered 0½-6½. When a supplemental set was combined with the standard set of the same number, the result was the equivalent of the next largest standard set. For example, combining set No. 4 with set No. 4½ produced the equivalent of a No. 5 set. There were just over 70 parts in the system, a relatively small inventory, plus a handful of electric motors and transformers; all of these items are shown in the illustrations in the AMB PARTS section lower down on this page. 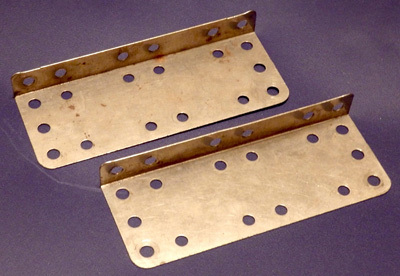 Most of the parts were made from pressed/stamped steel that was nickel plated. The remaining pieces, including pinion and worm gears, were machined from solid brass; the hubs (bosses) on the wheels, pulleys, and gear wheels were also made of brass, as were the hexagonal nuts. 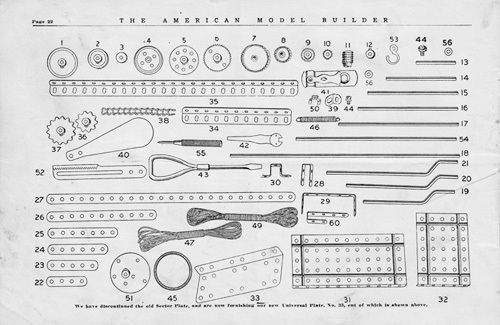 Although AMB was, in effect, a counterfeit Meccano system, Wagner did incorporate a number of parts and features that were improvements over Meccano (Hornby would eventually add these features to his own system). One of these features involved using grub (set) screws to attach wheels, pulleys, and gears to axle shafts. This method quickly became the standard for all similar systems, and remains so to this day. There were also minor differences in some key specifications - see the comparison table below for details. AMB sets were typically packed in heavy cardboard boxes, with the parts arranged in compartments of various sizes that were integrated into the box; stackable cardboard trays were used in larger sets as needed to accomodate all of the parts. 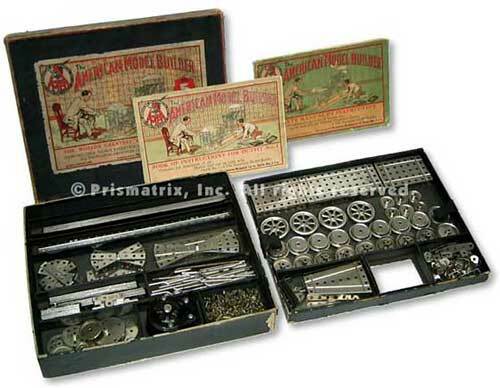 Bossed parts, including wheels, pulleys, and some gears, were typically attached to bright red, shiny cardboard inserts with t-clips; these inserts rested in the main compartment (small sets) or in the upper parts tray (larger sets). Small parts, including screws and nuts, were stored in small, flat multi-colored paper envelopes (see photo of the No. 1 set below). The largest sets were packed in handsome wooden storage cases with removable wooden part trays (see photo of No.7 set above). Brightly colored artwork was used on the manual covers and box lids; this artwork was modified several times over AMB's short run; some of the changes can be seen in the images shown at right. Now, let's look at one of the larger sets, the No. 5. 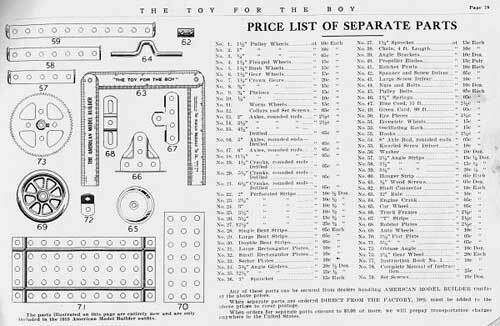 At 586 parts, including screws, nuts, and tools, plus two types of string, a manual, and a motor, it was at the upper end of the product line; only the No. 6 and No. 7 were larger. The box, made from heavy, reinforced fiberboard, was covered with black paper inside and out. It measured 12" x 9" x 2" and weighed 8 pounds. Parts were arranged in two compartmented trays, one removable, stacked one on top of the other (see photo below). 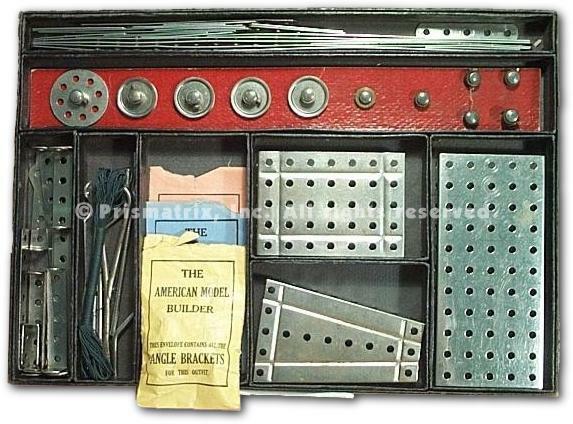 The set contained a wide variety of the standard part types, such as perforated strips, angle girders, pulleys and gears, flat and flanged plates, etc., plus a selection of more specialized or unusual parts, including sprockets, propellor blades, oscillating racks, and ratchet pawls, among others. The manual, which featured the same color cover art as the box lid, included set inventories and a part diagram along with the model instructions. The photos below show the two part trays in more detail. The lower tray (left) is actually formed into the bottom of the box. The sturdy upper tray has a black cloth loop glued to each end for lifting the tray, and a hole in the front to accomodate the electric motor. Cardboard dividers are integrated permanently into both the upper and lower trays to form separate storage areas for the different parts. As shown in the photos on this page, all parts are nickel plated steel except for the pinion and worm gears and nuts, which are brass. As I've investigated various systems from around the world, I am always intrigued by the parts that are different from those that are usually seen, some of which may be unique to one system or another. This is often true of the earlier periods of many systems. AMB, although a Meccano clone for the most part, is no exception to this. 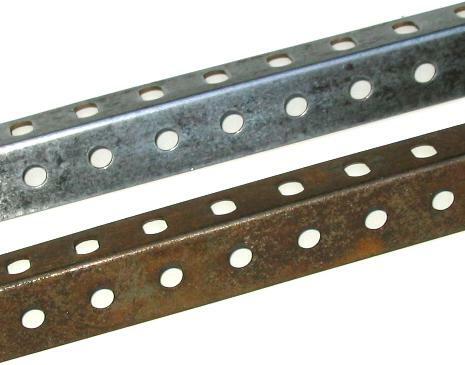 The system contains the usual mix of standard part types, such as perforated strips, angle girders, pulleys and gears, flat and flanged plates, etc., as well as an interesting assortment of modified versions of other standard types, plus a number of unique parts. The photos below show a small selection of AMB parts, while further down the page are part diagrams for all of the AMB parts. All parts were nickel plated steel, except for pinion and worm gears, and the square nuts, which were machined from solid brass. Gear wheels, pulleys, flanged wheels, car wheels, and sprockets were steel with brass hubs (bosses); the latter were single-tapped, unlike their double-tapped Meccano counterparts. Strips and girders were virtually identical to Meccano. An assortment of wheels are shown in the photo below. Note the #65 "car" (train) wheel shown at top center, and the spoked #69 "auto" wheel shown at botom left. The #4 flanged wheel at lower right has a serrated groove around its outer edge for string or cord so that it can function as a pulley. At far right is a #51 "eccentric wheel" with its offset hub. At the far left is a trunnion-like "truck frame" for use with both the auto and car wheels. 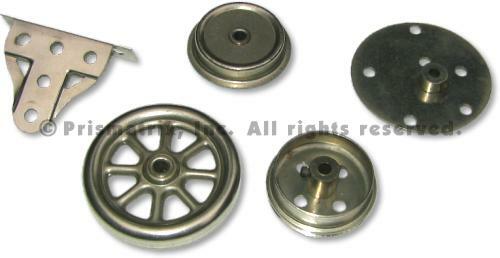 An assortment of wheels and related parts. Style No. 100 DC-powered electric motor. A close-up of angle girders, showing the round holes on one side and slotted holes on the other. The photo of the girders shown above illustrates the results of my favorite refurbishing technique. I have written about this technique elsewhere here at Girders & Gears; it involves using 4-0 steel wool in conjunction with automotive chrome polish to remove rust and grime from parts. When I acquired the No. 5 set shown in this feature, 10-15% of the parts had moderate to serious surface rust. The lower girder is one of these pieces. The upper girder was in the same state, but has been steel wool polished. Note that all of the surface rust is gone, and the piece has a nice smooth polish. However, the girder exhibits the dark staining that typically remains behind on more seriously rusted pieces. I find this a minor annoyance at most, as such pieces look so much improved over their original state. Keep in mind that only the more deeply rusted parts will have this staining; parts with minor surface rust or dirt will often look like new after a polishing. As with any technique of this kind, be sure to test this process on the back of a small part first - depending on the quality and condition of the original plating, some dulling of the surface may occur. Shown below are part diagrams for the AMB system. The first two images are early and late versions of the same manual page. As these two images indicate, parts changed very little over the short life of the system, although there were a few modifications and additions during those nine years. One notable example is part no. 33 (bottom center in each image), which began life as a sector plate and was later changed to a single flange half plate (see image below) near the end of the AMB run. Original part diagram manual page showing No. 33 Sector Plate. Later revised part diagram manual page showing No. 33 Flange Plate (image c/o K. Bisset). Part No. 33 (late version): Single Flange Half Plate (image c/o K. Bisset). Additional part diagram manual page. 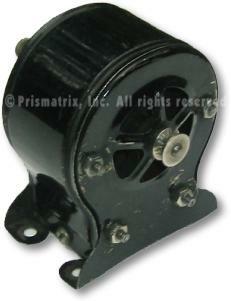 AMB electric motor and transformer options.